The Galaxie Collection combines a futuristic look with modern appeal to create a collection that is completely out of this world! These stem-mounted fixtures are highlighted by ½in. thick saucers of clear glass. The Brushed Nickel finished frames of the Galaxie Collection range from simple one light hanging fixtures to an intricate network of saucers of light. With a diameter of 14in., this Galaxie pendant is perfect for any room. It uses one, 60-watt (max.) bulb. If you're looking for a fixture that combines basic form with ultramodern design, the Galaxie Collection is for you. 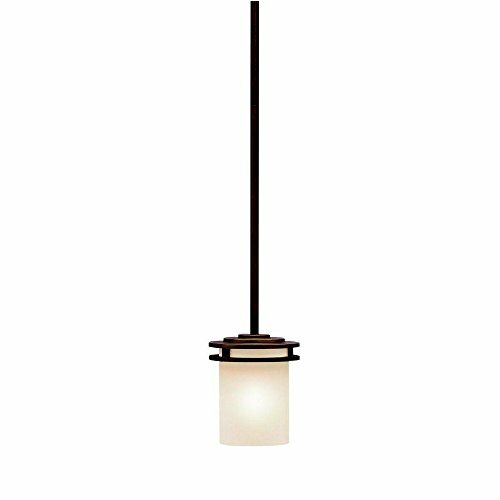 Capital Lighting 3561BB-252 Hill House Collection 1-Light Mini-Pendant comes in a warm Burnished Bronze finish complemented by Mist Scavo glass in a traditional design to enhance any decor for years to come. 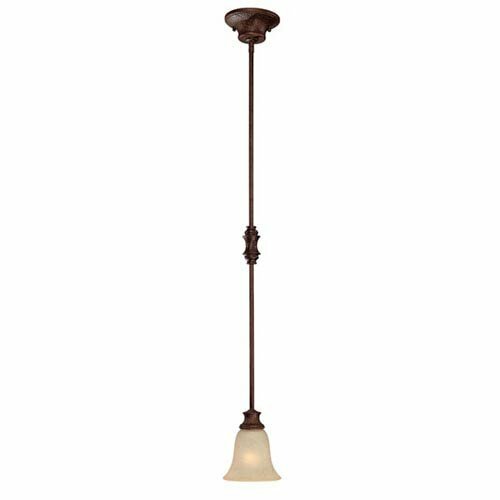 The 3561BB-252 is 6.5 inches wide x 47 inches high (maximum hanging height), and requires one 100-watt medium base incandescent bulb (not included) – dimmable using a standard incandescent dimmer. The 3561BB-252 comes one per package. Capital Lighting is a family-owned company located just outside Atlanta, Georgia. We pride ourselves on delivering stylish, high-quality products at affordable prices through the best lighting showrooms across the United States and Canada. As you browse our site, you will discover why Capital Lighting has earned a reputation for creating well-designed fixtures. Beginning with design concepts from popular home fashions, we transform our ideas into lighting fixtures that blend timeless beauty with today's styling. As our designs take shape, we make sure that a high standard of quality goes into manufacturing each fixture. From the casting and forging to the hand-painted finishes and fine details, we strive to make our products the best in the industry. A casual classic with simple lines transcend style with an elegant and charming appeal offered in two finishes. A builder dream, versatile and polished in pewter with white marble glass (topped off with a pewter rim). the perfect match for today's popular stainless steel appliances. This classic 1 light pendant will effortlessly add to the beauty of your home. Featuring a refined Olde Bronze(R) finish and beautiful Satin Etched Glass, this design can accent any space. Named after renowned Dutch architect, Hendrik Berlage, the Hendrik Collection is a gorgeous family of contemporary fixtures that honor the man who was regarded by many as the in.Father of Modern architecturein.. Much like Berlage himself, The Hendrik Collection is regarded as an intermediary between modern and traditional styles. Classic lines are enhanced with a soft touch of current style cues to work in a number of aesthetic environments. The warm hue of our Olde Bronze finish is partnered with light umber etched glass for a fantastic balance of natural color. 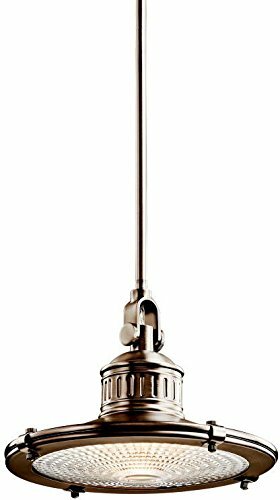 The 1-light Hendrik Mini-Pendant uses a 100-watt (max.) bulb, measures 5 in. in diameter with a body height of 7 in.. It comes complete with 104in. of extra lead wire as well, allowing for easy installation. 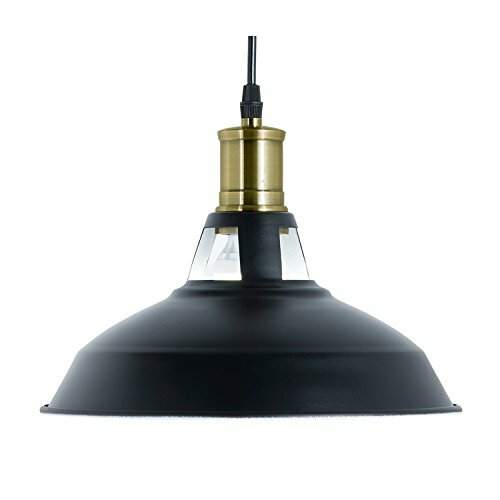 Classic industrial form in a pendant with a Fresnel lens is what you will find in this Olde Bronze fixture. 1 light, 100-W (M) max. Diameter 8in., body height 10 1/2in. and overall 48in.. Extra lead wire 100in.. For additional chain order No 2996OZ. For additional stem order No. 2999 (12in.)OZ. 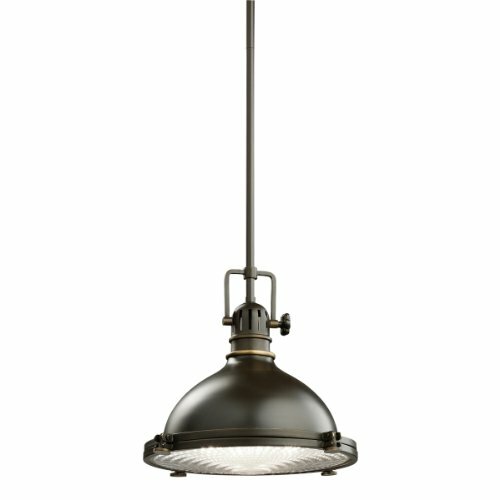 Introduce a little industrial flair with the Danica Pendant Lamp. 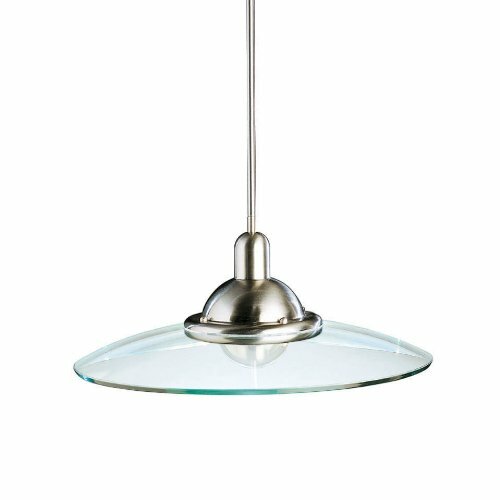 Ideal for the kitchen island or cool breakfast nook, this pendant features a classic rounded shade with a sleek profile and iron construction. Lighting peeking from the top of the shade adds another layer of dimensionality. A black exterior finish blends seamlessly with your decor, creating a look that's character-rich without going overboard. White finishing on the interior of the pendant delivers crisp, true illumination for both tasks and ambiance. An homage to the security and pragmatism of the historic lighthouse, this 1 light pendant from the Sayre(TM) collection utilizes a Fresnel lens that creates a focused beam that is both supple and controlled. This design features a wide, flat pendant embellished modestly with a subtle ribbing for added texture. 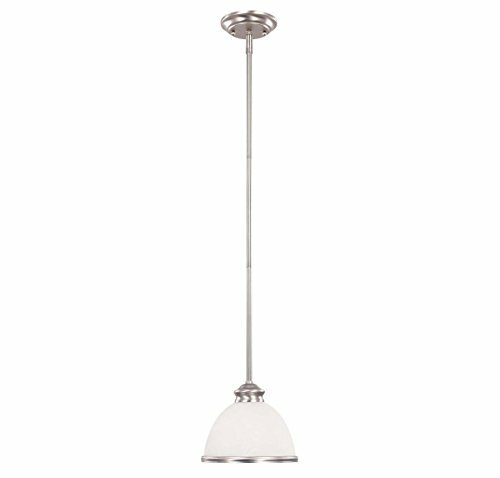 Touched with an Antique Pewter finish, this Sayre(TM) fixture is the ideal complement to any home office or workspace. Sloped ceiling kit included. The Galaxie Collection combines a futuristic look with modern appeal to create a collection that is completely out of this world! These stem-mounted fixtures are highlighted by ½in. thick saucers of clear glass. The Brushed Nickel finished frames of the Galaxie Collection range from simple one light hanging fixtures to an intricate network of saucers of light. With a diameter of 22 ½in. and 9in. 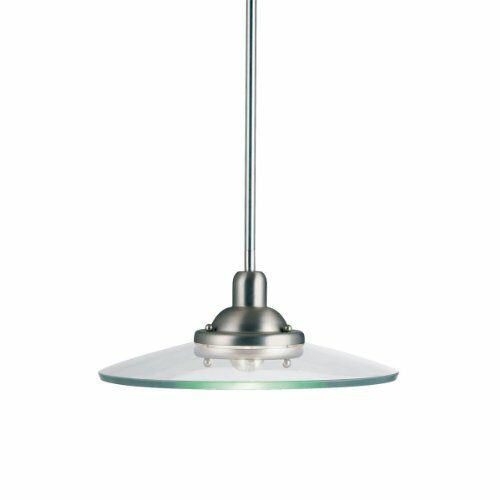 in body height this Galaxie pendant is perfect for any room. It uses one, 150-watt (max.) bulb for strong lighting output. If you're looking for a fixture that combines basic form with ultramodern design, this Galaxie Collection pendant is for you. 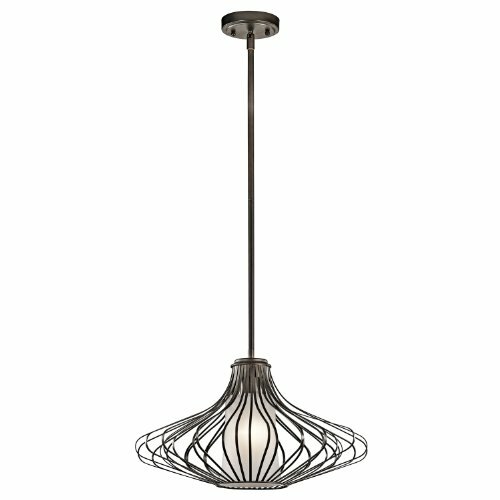 Compare prices on 1 Light Nook Pendant at ShopPlanetUp.com – use promo codes and coupons for best offers and deals. We work hard to get you amazing deals and collect all available offers online and represent it in one place for the customers. Now our visitors can leverage benefits of big brands and heavy discounts available for that day and for famous brands.